"Too often, people wait until they need a solution before they look for one," says Mountain Home Care founder Lana Wilde. "We want to get the information for good, solid decision making into their hands sooner than later." The “Home Care Guide” is a no-cost, high value e-book publication to assist individuals and families with the information about managing the impact of aging on their loved ones. The “Home Care Guide” focuses on the core knowledge sought by hundreds of families in thousands of conversations the Wilde family and their highly qualified staff had over the past decade. The book’s contents are informed by an intimate knowledge of best practices in the field, current changes in health care practice, and families’ most frequent questions about paying for care. The “Home Care Guide” is designed like a workbook, says Jeremy Wilde, vice president. Family decision-makers may take advantage of the checklists, work sheets, and how-to guidelines to focus thought processes – and share their thinking with one another, he explains. What emerges is an understanding of next steps on the journey of caring for those we love who are dealing with the realities of aging, he says. Families in need of additional assistance or insights will also be able to request a personal conversation with Jeremy Wilde to hone in on their more specific questions. Since 2003, Mountain Home Care, Arden, remains the leading provider of private home care, geriatric care management and skilled nursing services in western North Carolina. 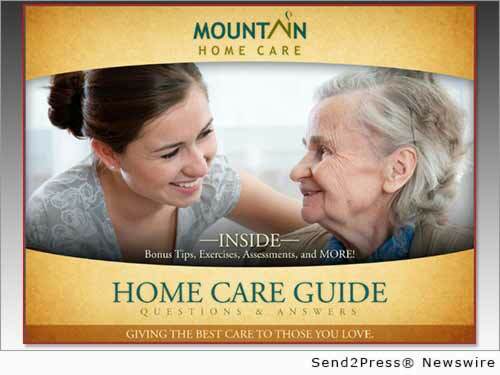 Download your copy of the free “Home Care Guide” at http://www.mountainhomecare.com/. Original Keywords: aging in place Mountain Home Care Arden North Carolina ARDEN, N.C.
REFERENCES: Books and Publishing News, aging in place Mountain Home Care Arden North Carolina ARDEN, N.C.